but I was wondering if there was any other way to deal with the squirrel spotters. Headlight tint? I like the beam level as it is, but the squirrel spotters are a bit too high. wtf is a squirrel spotter? Its a design feature that causes some of the light from your low beams to go up so you can read signs (which are of course higher than your low beams) or "spot squirrels" in the trees. 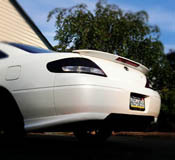 Some headlights use the design of the reflector to do this, some (like a projector) add a little "tab" to accomplish the same effect. With the standard halogen bulbs the amount of light sent "up" is enough to read signs but not enough to bother oncoming drivers too much. the best way to do this is opening up and taping it with aluminum tape to completely seal it off, but if you already have the headlight apart might as well do a proper HIDretrofit. This defeats the purpose of have projectors. I think that plate it so it doesnt glare and blind people on the roads. Thats if the modded one is the white light on the left of the last photo. I found something really funny. Before I had 6000k bulbs, it gave a slight blue tint to the lights. With those in, the squirrel spotter marks were so noticeable. But now, I switched the bulbs to 5000k and I haven't seen any noticeable squirrel spotter lines. I was just about ready to remove the headlights too. When I did HIDS in my wife's solara I completely blocked the squirrel spotters... You SHOULD do that if you are installing HID's anyways so you don't blind people with the light. This is partially blocked off. I will get a picture of them completely blocked off. Definitely a mod worth doing if doing HIDS. It might be something with the bulbs, and the source of the arc in the xenon bulb being thinner?